Mulan, a brave girl, decided to impersonate as a man to join the army to take her father's place. Helped by her outrageously funny guardian dragon Mushu, Mulan strives to earn the respect of her fellow warriors and their courageous Captain Shang. 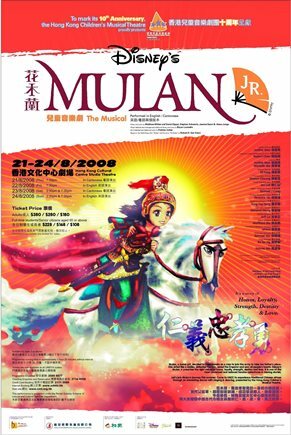 Mulan's adventures lead to climatic battle atop the Imperial Palace, where her family's honor and the fate of the Emperor and all of China rests in her hands! Tickets are available at all URBTIX outlets, on the Internet and by telephone.